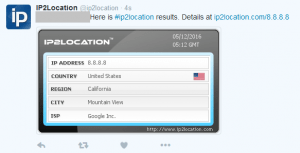 You can now lookup an IP location by tweeting a message to IP2Location Twitter account. There is no additional configuration required to use this service. By just mentioning us (@ip2location) with an IP address, you will receive a message to your Twitter account containing the IP location information. This works for both IPv4 and IPv6 address. Below are the guideline to use the service. On your Twitter account, write a message with the below syntax and tweet. You just need to mention us (@ip2location) followed by and IP address(either IPv4 or IPv6). Within minutes, you shall receive a response to your Twitter account. Below please find the screenshot of the response message. It’s as easy as that. Try it now!